The conical shaped concrete elements are series-produced in our precast plants at our headquarters in Sengenthal and in Osterrönfeld in Schleswig-Holstein. These locations offer ideal access to waterways, which means the Hybrid Towers can be transported quickly and safely to each location in Europe. Prefabrication guarantees continuous quality assurance of the production process and allows us to produce up to 500 towers a year at both facilities. 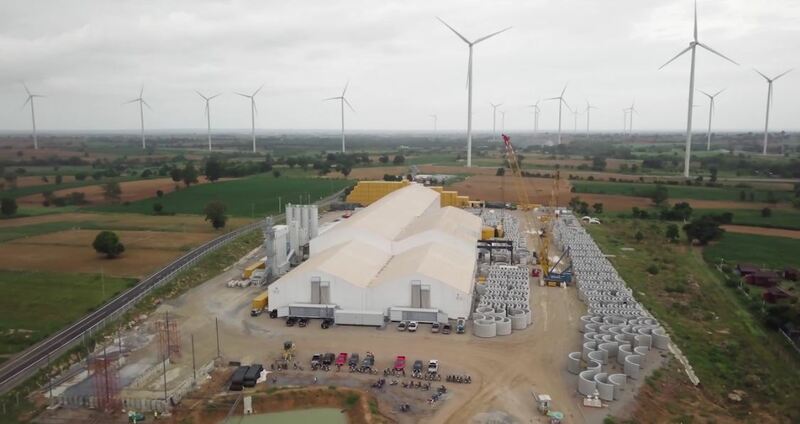 To provide our international operating customers higher flexibility in the construction of wind farms, we developed a mobile fabrication concept and adapted our german manufacturing plants for a serial production of the modular concrete segments worldwide. This allows us to achieve the same high level of quality at any location in the world and a production output of up to 300 towers a year. The modular assembly and disassembly of the mobile fabrication offers the highest flexibility in servicing different project sites across the globe. It also increases the added value in the respective country of manufacturing. On-site production avoids expensive long-distance and heavy-load transports and supports the regional economy through targeted investment.